The Ewa Marine D-CG6 housing is manufactured from double laminated PVC and has an integrated, optically neutral flat glass port. It has a pair of non-corrosive, seawater resistant clamping rails that fit together to form the seal and are secured in place by means of two screw knobs. Rated to a depth of 33' (10m). 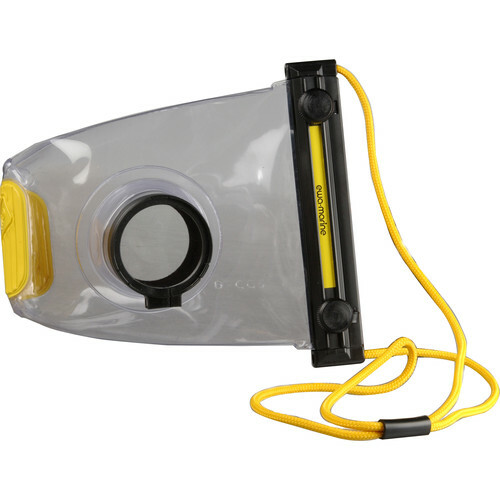 This versatile housing can be used in a variety of applications like sandy or dirty conditions, kayaking, or while swimming, snorkeling or diving. It's easy to operate the camera as its various components and buttons can be operated through the PVC. The D-CG6 housing was specially designed for the Canon Powershot G6. It will also fit cameras that are smaller than 7.28 x 3.54 x 2.10-3.94" (185 x 90 x 75-100mm) (WxHxD). Long lasting housing solution that is easy to maintain and packs in minimal space. Accesses to all camera functions through the PVC. Small enough to use for other sporting activities like skiing or fishing. Can change buoyancy by adding air or weight. Priced significantly less than conventional housings. Box Dimensions (LxWxH) 10.8 x 8.4 x 2.6"